The phrase "embossing stamp" is a technical, industrial term that can sometimes cause confusion for those not familiar with the marking industry. For instance, if someone were using a hot stamp die to stamp leather, it would be debossing, but the user might refer to the resulting mark (incorrectly) as embossing. The part used to create the impression is referred to as a die, but the image created in the leather is recessed (debossed). The phrase “custom metal embossing stamp” is really a misnomer. There are custom metal stamps and dies that create debossed images, and there are custom metal embossing type and dies that create embossed images. To understand what a metal embossing stamp is and isn’t, it is important to understand the difference between embossing and debossing. The first thing to clarify is the difference between embossing and debossing. Simply put, embossing creates a raised impression in the material being stamped. Debossing creates a sunk impression. 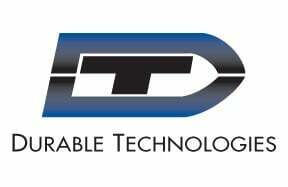 The term "debossing" is more prevalent in hot stamping applications (leather) as opposed to industrial part marking applications (metal). Stamps, like the hand stamps shown below, have a raised area on the stamp face that when struck with a hammer creates a debossed (sunk) impression in a material like leather or plastic. We also manufacture embossing type for package date coding application where you have male (raised copy) and female (matching sunk copy) type that fit together to leave a raised date code (most commonly found on can lids). This type of embossing type is typically used with canning, closing, and seamer machines. See below for an example of an embossed date code impression on a can lid made using male and female embossing type. 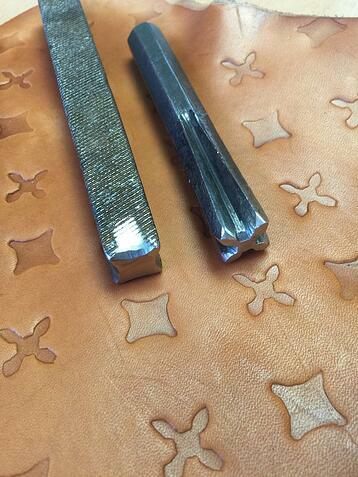 There are many types of embossing dies that are used in industrial settings. Our custom steel embossing and coining dies, for example, are often used in the sheet metal industry to create permanent, raised letters, trademarks, code symbols, patterns, and other designs on sheet metals. 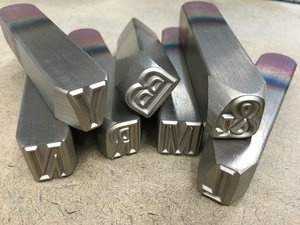 We have written a lot on the Durable Industrial Marking Blog about custom metal stamps, and you can follow the links below to learn more about personalization and customization with metal stamps. Typically, however, custom metal stamps are used in low volume applications to add a static part number or personalization to a material like wood or metal. 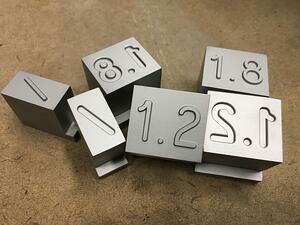 Check out the links below to see some examples of debossed marks created with metal stamps. You can learn more about embossing dies and metal stamps by contacting us here with any questions you might have or to request a quote. This post was published on January 31, 2019 and updated on January 31, 2019.